This Persian area rug will instantly enhance any home. The boasts a beautiful oriental pattern and is made with 100-percent polypropylene. The sturdy construction and soft pile ensure lasting style and comfort underfoot. 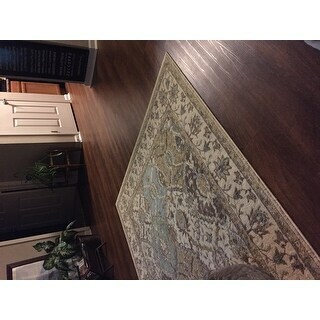 Option: Beige - 5'3" x 7'3"
This rug is beautiful! I do think the colors are more intense than they appear online; the beige is definitely darker than I expected. There is no pink anywhere; perhaps they meant "dusty sage" or something to that effect, because there are touches of green in the rug design that aren't noted in the color description. For the price, this is a beautiful, classic rug that seems to be very well made. I love that it has cooler accent tones (blue and green); so many oriental rugs are full of red and burgundy and it can be hard to find one without. The muted colors keep the very intricate design from feeling too busy. This rug goes great in the living room area of my studio apartment and defines the space beautifully. Option: Beige - 7'10" x 10'6"
I was so happy with this rug when it arrived. It was so inexpensive that I did not expect it to be so pretty and durable, but I was wrong. It is more beautiful in person than in the picture. It unrolled well and it was easy to vacuum. For almost 8 months, every time I walked through the dining room where the rug sat, I thought about what a great deal it was. Then it happened - I dropped a full glass of water on the rug. Before I could grab a towel and run back, it had already started to ripple where it was wet. I dried it the best I could then left it to air dry, hoping it would smooth out once it was dry. That didn't happen. It is rippled and funny and even after leaving something heavy on it for days I cannot get it to lay flat again. Bottom line, if you need a beautiful, affordable area rug and there is no chance of liquid being near it, this rug is for you. If there is a possibility that this rug might accidentally get wet, spend a little more money. Option: Multi - 5'3" x 7'3"
Rug arrived quickly and laid flat almost immediately because it was rolled up with the carpeted side on the outside, just the way it should be if packed properly. I had expected a bit darker burgundy red but it actually goes with my new hardwood floors even better. I have now bought three rugs, a Tiffany-style lamp and a coffee table from Overstock, all were delivered quickly, undamaged and have made excellent additions to my newly remodeled home. Count me as a highly satisfied customer who will buy from Overstock again and again! Read the description. I knew I wasn't getting wool when I made this purchase. There really is a difference. This rug is light and definitely needs a rug pad to stay in place and prevent tripping hazards. A wool rug will lay flatter and has a different feel. This rug is nice, very pretty and soft, with color true to the picture - but it's definitely not the same quality as a wool rug. 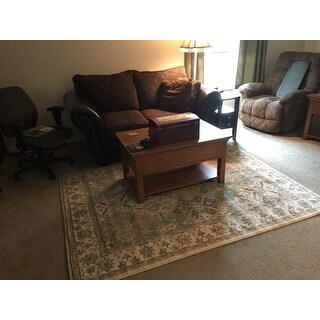 Option: Beige - 3'11" x 5'3"
I purchased this particular rug size for the center of my living room. It looks great. One would never guess it is an outdoor rug, as well. It is easy to clean which I rarely need to do. Having two cats it is helpful that the rug is easy to clean if any infrequent accident occurs. My cats definitely approve, as they love laying on it, the minute I placed on floor. A quality indoor/outdoor rug from my lengthy experience of using both this type vs. a regular "indoor only rug" has been a good experience and choice for me. My house hold has always included multiple cats; and I do clean my wood floors frequently due to shedding and paw prints. A quality indoor/outdoor rug for me has always allowed me low maintenance, plus I do not panic when unexpectedly a kitty's dinner did not settle well in her tummy.. I highly recommend the purchase of this rug dependent upon your color scheme. It has a nice range of subtle colors which help bring the look of a room together. The seller was excellent with speedy service and packaging. I have already made other similar rug purchases. If you know your color scheme and have a special place in mind (always measure the area you are considering and compare it to your potential selection), do not hesitate with a purchase. The quality, value and seller service are excellent! Option: Multi - 3'11" x 5'3"
The Nourison Modesto area rug is a beautiful area rug. I love colors and for the price you can't be beat. I use it in my living room under my coffee table, and its gorgeous. I highly recommend this beautiful rug. I like the colors on this rug. It really makes a difference in the area I have placed the rug. Would definitely recommend adding this to your decor. Option: Beige - 2'2" x 7'3" Runner | Beige - 3'11" x 5'3" | Beige - 5'3" x 7'3"
Love the rug. Good quality - color is exactly as pictured. I actually have three different sizes of this rug in my home. 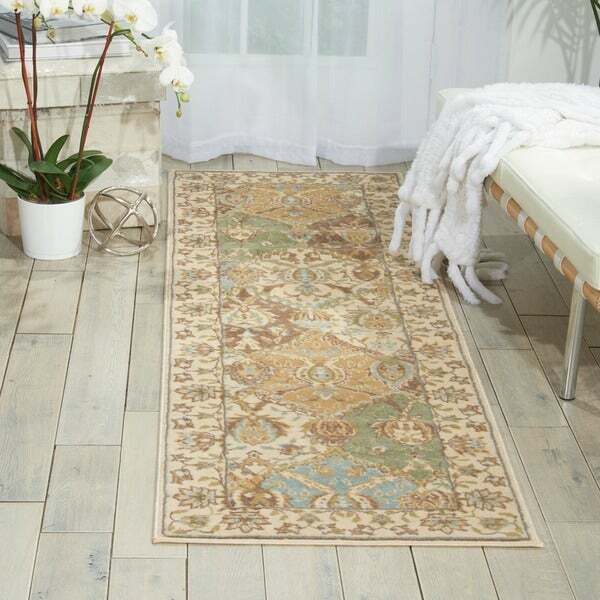 Option: Multi - 2'2" x 7'3" Runner | Multi - 7'10" x 10'6"
I ordered this Nourison Modesto Multi-colored Traditional Area Rug because of the abundant array of colors, it will be easy to match most any decor. 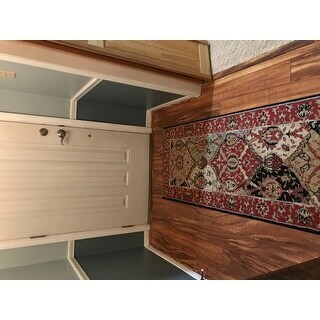 Option: Multi - 7'10" x 10'6"
While the return process was easy with Overstock, the rug was not at all what I was hoping for. While large, it was very thin(very light) unlike the 1/2 inch description given and it felt plastic-like. I knew as soon as I unwrapped it that it was heading back. 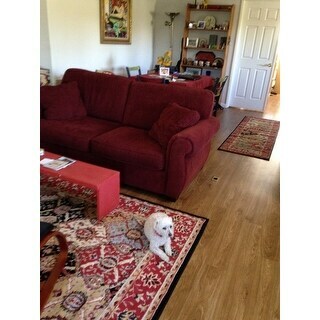 Option: Multi - 2'2" x 7'3" Runner | Multi - 5'3" x 7'3"
We are very happy with our rugs. And our poodle Danny Boy looks great on them! Option: Beige - 2'2" x 7'3" Runner | Beige - 5'3" x 7'3"
Looking for a neutral rug with a pop of color, I found this little gem! The blues and greens are subtle but definitely show up nicely with the beige and browns. It looks awesome against my wood floor and I get so many compliments. I loved it so much, I ordered the runner too! Great look, great price, I love it! Option: Multi - 2'2" x 7'3" Runner | Multi - 5'3" Round | Multi - 5'3" x 7'3"
This is a gorgeous rug. It goes perfectly with our new floor and our new paint job. I love walking in the front door and seeing this beautiful entry way! It is a pretty rug. However, it is a little thin. Not enough to return. This rug was perfect for my daughter! I definitely recommend this to anyone. It's well made and of good quality. Bought this for my sister. She picked it out Loves it, also bought large area rug. Love the colors, saves her high traffic wooden floors. I ordered this for my son's apartment in the dark red/navy color. He absolutely loves it and has gotten a lot of complements on it. He said that it has held up well under his dining table. Very nice rug. very soft feel to the hand. The colors are muted and soft. I love it in my living room. It works well in heavy traffic area. Nice carpet, colors are beautiful price is right! Using two of these for my hallway and get compliments every time we have company. Keep the floors warm and makes the hallway seem longer than it actually is. Really awesome colors! Goes perfectly in my outdoor kitchen. "Need rug size 9 x 12"
"Hi Can this rug be used in the bathroom, if a pad is purchased?" Yes this can be used in a bathroom with a rug pad. "How to get free shipping and where can find coupons ?" "11x13 feet carpet on sale"
This is approximately 0.5 inches thick. I'm not sure of the exact measurement of thickness but it feels soft and well made to walk on. "How thick is this rug? " This rug has a 0.5-inch pile height. "Is teal a color in rug?"